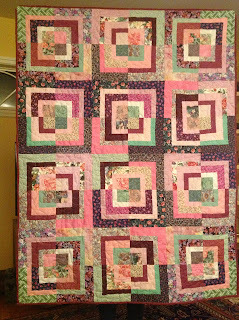 Quilting Journey of a Grandma...moving on to new things! Benito box....found a tutorial on doing this on the internet. I had never heard of it before. I think the secret to getting a pleasing look is to choose 4 fabrics that complement each other. I mentioned this one in another blog. 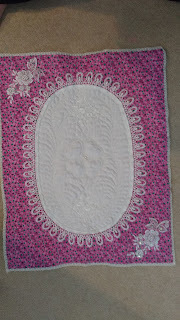 I just kept sewing cutting and sewing being sure to add white every so often, Then I did different FMQ in each white section. This probably has an old traditional name but not sure of it. 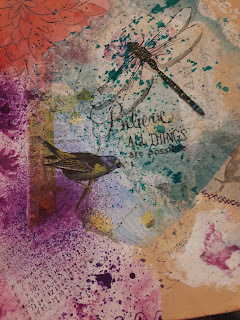 I still have no printer so I can't continue yet with my other pieces so I went on to try some paper collaging with the idea of making either post cards called ATC's or Artist Trading Cards. Last night I worked on a piece on card stock and got near the end and I thought it looked quite good and then I decided to add a spray of a very pretty ink only I think I must have held it too close to the paper and it sort of made small blobs instead of a fine spray that I wanted. Well, I am on a learning curve. Anyway here is a picture not sure my phone camera has not done a good job. Using the same bird print, (had made a few copies)I tried again. This time I used the same dragonfly design from a napkin. It has some colour and probably some more design elements to add but I am pleased how it is progressing. 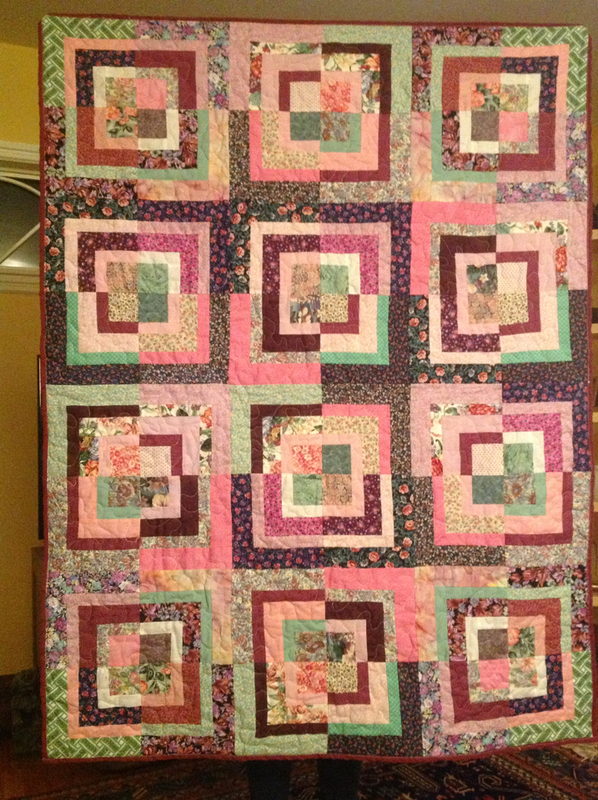 A few months ago I started a very small group of ladies who are helping me quilt and sew for the purpose of assisting in the purchase and ongoing work of setting up to homes in our area for the rescuing of young women being rescued from thehuman traficing trade. One home will be for the initial receiving and the second will deal with their continued needs of preparing them to enter the work place. furnish the homes and the grocery bags as gifts. Three small knitted baby afhgans were donated as well. This is a tote bag with a matching zippered pouch. This is my cleaning lady who bought it from me before I could blink. 100% of the proceeds have been given to the Elora House.